Popular international student adviser Gloria Evans died suddenly on Dec. 25. During her long tenure at the College, Evans went to tremendous lengths to help foreign students adjust both culturally and physically to life in the United States. Not only did she initiate a special orientation period for international students but she also went out of her way to organize shopping excursions to local stores, enabling them to obtain everyday items they were unable to bring with them from their homes. During the first weeks of the spring semester, the bulletin board for international students in the main hall of Parrish was festooned with colored notes containing tributes and messages of gratitude to beloved International Student Adviser Gloria Evans, aged 81, whose unexpected Dec. 25 death due to complications from knee surgery saddened campus community members. Evans was “awesome”; “always hip and modern”; “our mom away from home”; “elegant, gracious, and full of warmth,” the students wrote. She went “far beyond her role as adviser” and had “a smile that lit up [her] face, even when I knew [she] was tired,” to quote but few. Obtaining a Ph.D. from Stanford University, Evans came to Swarthmore in 1957 as an assistant professor of psychology. 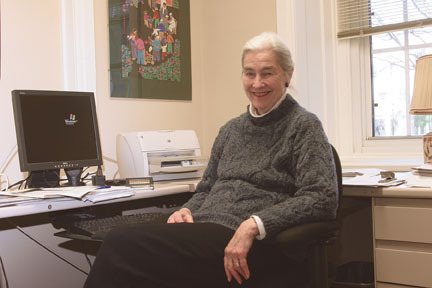 She remained at the College for more than 50 years, serving as a faculty member, testing and guidance consultant, and ultimately adviser to international students and visiting scholars. 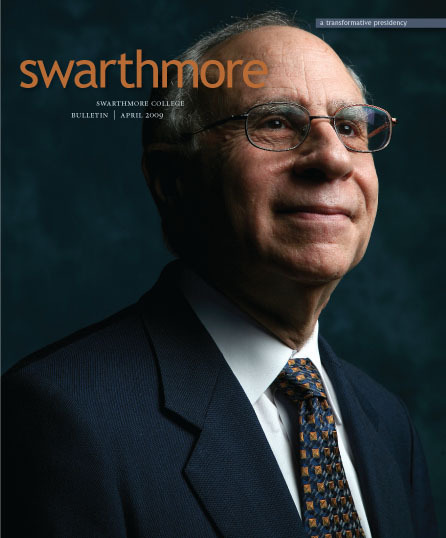 While at Swarthmore, she met her husband, the late physician Philip Evans ’48—for whom the College’s Evans Scholarship is named—and also served on the advising team for Evans Scholars during their years at Swarthmore. As international student adviser, Evans, an enthusiastic traveler, especially to Europe, went to great lengths to ensure that foreign students felt comfortable at the College. She taught an English for Foreign Students course, served on a Foreign Students Committee, and counseled international students on immigration and visa issues as well as other aspects of living and studying in a foreign country. She initiated a three-day program of activities specifically for international students—that preceded the regular three-day freshman orientation—to help them adjust to life in the United States. During their orientation, Evans met each foreign student and any relatives who accompanied them to Swarthmore. She became an invaluable resource and friend to the students throughout their college lives. For those who came to the College without many of the typical student necessities, too heavy or bulky to transport by air, she facilitated shopping expeditions to Target and other nearby stores.